Future housing and employment plans for the Chichester area will now face eight weeks of public scrutiny after the district council put its preferred local plan out to consultation. The plan, which identifies sites for housing and employment for the period up to 2035, includes government-set targets for 12,350 new homes – 650 per year – and more than 230,000sqm of business floorspace. Chichester already has an adopted local plan but has to review it every five years, with the next one due by 2020. If it is not brought up to date, the council would risk having very little control over the size or location of any proposed developments. At a meeting at East Pallant House on Tuesday (November 20), Susan Taylor, cabinet member for planning services, said the consultation was an opportunity for the community to ‘engage in a positive, constructive way’ and to ensure that future development was planned, with control over infrastructure, design and location. She added: “We live in a very beautiful part of the country and, naturally, wish to ensure that its unique qualities are preserved. The plan is split into two parts, with the first setting out some of the key planning issues and challenges as well as the preferred strategies, including specific sites for development. The majority is planned for the east-west corridor, including the city itself, while moderate development is planned for the Manhood peninsula and the north of the district. The second part of the plan sets out the development management policies, including design, heritage, housing tenure and housing mix. The plan excludes parts of the district within the South Downs National Park. 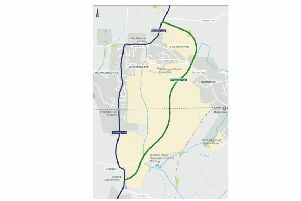 Some concerns were raised about proposals for the A27 around Chichester which were included in the plan to mitigate the extra traffic that will be generated by the new homes. With some criticising them as a re-hash of the unpopular ‘option 3’ which was proposed during Highways England’s 2016 consultation, council leader Tony Dignum assured the meeting that was not the case. He said: “In preparing the plan, officers have had to assume that there will be no major scheme implemented by Highways England before another plan review is due in 2025. “But the council is required to arrange plans to be prepared to offset the impact of new development on the A27 and local roads. “In the absence of a major Highways England scheme there is no alternative to making relatively minor at grade – that means no flyovers – improvements to the existing A27. “This does not mean the council is embracing any of the Highways England 2016 options for the existing A27. The consultation will run from December 13 to February 7.